Want to be notified of new releases in GoogleChrome/lighthouse? Lighthouse is integrated directly into the Chrome Developer Tools, under the "Audits" panel. 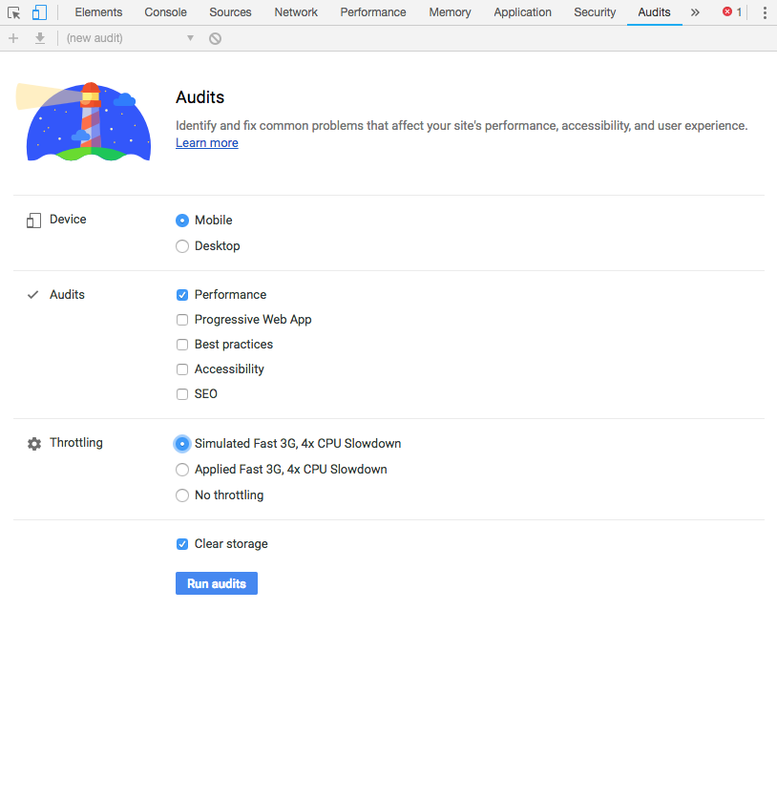 Run it: open Chrome DevTools, select the Audits panel, and hit "Run audits". The Chrome extension was available prior to Lighthouse being available in Chrome Developer Tools, and offers similar functionality. Installation: install the extension from the Chrome Web Store. Run it: follow the extension quick-start guide. The Node CLI provides the most flexibility in how Lighthouse runs can be configured and reported. Users who want more advanced usage, or want to run Lighthouse in an automated fashion should use the Node CLI. Lighthouse requires Node 10 LTS (10.13) or later. By default, Lighthouse writes the report to an HTML file. You can control the output format by passing flags. --additional-trace-categories  Additional categories to capture with the trace (comma-delimited). --config-path                  The path to the config JSON. Chromium version 66.0 or later. By default, any detected Chrome Canary or Chrome (stable) will be launched. WARNING: If the --config-path flag is provided, this preset will be ignored. --max-wait-for-load            The timeout (in milliseconds) to wait before the page is considered done loading and the run should continue. --output-path  The file path to output the results. Use 'stdout' to write to stdout. If using JSON output, default is stdout. If using HTML or CSV output, default is a file in the working directory with a name based on the test URL and date. If using multiple outputs, --output-path is appended with the standard extension for each output type. "reports/my-run" -> "reports/my-run.report.html", "reports/my-run.report.json", etc. lighthouse <url> --output=json --output-path=./report.json --save-assets  Save trace, devtoolslog, and named JSON report. lighthouse <url> --emulated-form-factor=none                              Disable device emulation and all throttling. For more information on Lighthouse, see https://developers.google.com/web/tools/lighthouse/. You can run a subset of Lighthouse's lifecycle if desired via the --gather-mode (-G) and --audit-mode (-A) CLI flags. # Normal gather + audit run, but also saves collected artifacts to disk for subsequent -A runs. # You can optionally provide a custom folder destination to -G/-A/-GA. Without a value, the default will be `$PWD/latest-run`. The first time you run the CLI you will be prompted with a message asking you if Lighthouse can anonymously report runtime exceptions. The Lighthouse team uses this information to detect new bugs and avoid regressions. Opting out will not affect your ability to use Lighthouse in any way. Learn more. You can also use Lighthouse programmatically with the Node module. Read Using Lighthouse programmatically for help getting started. Read Lighthouse Configuration to learn more about the configuration options available. Lighthouse can produce a report as JSON or HTML. Running Lighthouse with the --output=json flag generates a JSON dump of the run. You can view this report online by visiting https://googlechrome.github.io/lighthouse/viewer/ and dragging the file onto the app. You can also use the "Export" button from the top of any Lighthouse HTML report and open the report in the Lighthouse Viewer. In the Viewer, reports can be shared by clicking the share icon in the top right corner and signing in to GitHub. Note: shared reports are stashed as a secret Gist in GitHub, under your account. Useful documentation, examples, and recipes to get you started. The session from Google I/O 2018 covers the new performance engine, upcoming Lighthouse REST API, and using the Chrome UX report to evaluate real-user data. Read on for the basics of hacking on Lighthouse. Also, see Contributing for detailed information. Getting started tip: node --inspect-brk lighthouse-cli http://example.com to open up Chrome DevTools and step through the entire app. See Debugging Node.js with Chrome DevTools for more info. This section details services that have integrated Lighthouse data. If you're working on a cool project integrating Lighthouse and would like to be featured here, file an issue to this repo or tweet at us @_____lighthouse! Calibre - Calibre is a web performance monitoring tool running Lighthouse continuously or on-demand via an API. Test using emulated devices and connection speeds from a number of geographical locations. Set budgets and improve performance with actionable guidelines. Calibre comes with a free 14-day trial. Fluxguard - Fluxguard provides website DOM change monitoring orchestrated with Google Puppeteer, and audited by Lighthouse. Fluxguard is a freemium product, with monthly monitoring of up to 75 pages for free. Foo - Foo continuously monitors performance with Lighthouse and provides a timeline chart by day, week, or month. Users can receive alerts via email, Slack, and PagerDuty. Foo offers free and paid products. HTTPArchive - HTTPArchive tracks how the web is built by crawling 500k pages with Web Page Test, including Lighthouse results, and stores the information in BigQuery where it is publicly available. Lighthouse Keeper - Lighthouse Keeper monitors your pages' Lighthouse scores and notifies you if they drop below your thresholds. Lighthouse Keeper is a free service that monitors up to 3 URLs once per day. SpeedCurve — SpeedCurve is a tool for continuously monitoring web performance across different browsers, devices, and regions. It can aggregate any metric including Lighthouse scores across multiple pages and sites, and allows you to set performance budgets with Slack or email alerts. SpeedCurve is a paid product with a free 30-day trial. Treo - Treo is Lighthouse as a Service. It provides regression testing, geographical regions, custom networks, and integrations with GitHub & Slack. Treo is a paid product with plans for solo-developers and teams. Web Page Test — An open source tool for measuring and analyzing the performance of web pages on real devices. Users can choose to produce a Lighthouse report alongside the analysis of WebPageTest results. Other awesome open source projects that use Lighthouse. webpack-lighthouse-plugin - run Lighthouse from a Webpack build. lighthouse-batch - run Lighthouse over a number of sites and generate a summary of their metrics/scores. lighthouse-badges - Generate gh-badges (shields.io) based on Lighthouse performance. lighthouse-cron - Cron multiple batch Lighthouse audits and emit results for sending to remote server. lightcrawler - Crawl a website and run each page found through Lighthouse. lighthouse-lambda - Run Lighthouse on AWS Lambda with prebuilt stable desktop Headless Chrome. Garie — An open source tool for monitoring performance using Lighthouse, PageSpeed Insights, Prometheus, Grafana and Docker. lighthouse-ci - Run Lighthouse and assert scores satisfy your custom thresholds. 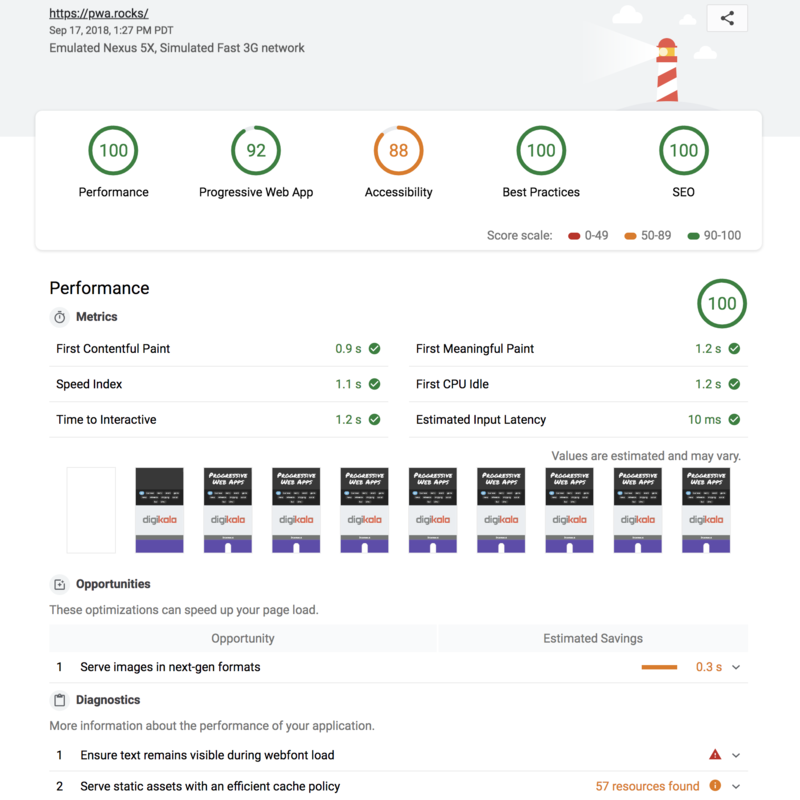 lighthouse4u - LH4U provides Google Lighthouse as a service, surfaced by both a friendly UI+API, and backed by Elastic Search for easy querying and visualization. react-lighthouse-viewer - Render a Lighthouse JSON report in a React Component. Can I configure the lighthouse run? Yes! Details in Lighthouse configuration. How does Lighthouse use network throttling, and how can I make it better? Good question. Network and CPU throttling are applied by default in a Lighthouse run. The network attempts to emulate slow 4G connectivity and the CPU is slowed down 4x from your machine's default speed. If you prefer to run Lighthouse without throttling, you'll have to use the CLI and disable it with the --throttling. * flags mentioned above. Read more in our guide to network throttling. Are results sent to a remote server? Nope. Lighthouse runs locally, auditing a page using a local version of the Chrome browser installed the machine. Report results are never processed or beaconed to a remote server. How do I author custom audits to extend Lighthouse? Tip: see Lighthouse Architecture for more information on terminology and architecture. Lighthouse can be extended to run custom audits and gatherers that you author. This is great if you're already tracking performance metrics in your site and want to surface those metrics within a Lighthouse report. If you're interested in running your own custom audits, check out our Custom Audit Example over in recipes. We'd love help writing audits, fixing bugs, and making the tool more useful! See Contributing to get started. Lighthouse, ˈlītˌhous (n): a tower or other structure tool containing a beacon light to warn or guide ships at sea developers.